Carmen Serghi was born in Romania and has lived in Georgia for 20 years. She earned a Bachelor in Electronic Engineering, a Master in Sociology from the University of Bucharest, Romania, and a Master Degree in Business Administration from Heriot-Watt University in Edinburgh, Scotland. 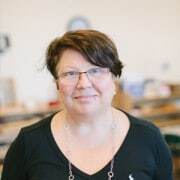 After eleven years of teaching Montessori at different levels, Carmen became interested in IB programs and became IB DP Coordinator for MASS currently in the authorization process. She is keenly interested in world cultures and has traveled extensively in about a dozen countries on three continents. She is a naturalized US citizen, residing in Alpharetta, GA, with her husband Daniel of fifteen years old twin daughters, AnneMarie and Sarah.